March 19th, 1988. NASA Earth Observatory images by Jesse Allen, using Landsat data from the U.S. Geological Survey. Between 1988 and 2017, urban development encroached on mangroves in several areas. For instance, the Deonar landfill spread significantly, and new residential and commercial development emerged along the northern stretches of Thane Creek. Many of the rivers, creeks, and other waterways that run through Mumbai are flanked by green. These areas are havens for mangroves — short, shrubby trees with waxy leaves and tangles of finger-like roots that rise out of the swampy, sandy areas. In this booming city, India’s largest, mangrove forests have historically been overlooked. Large tracts of them were removed as part of land reclamation projects, and many of the mangroves that remain have become dumping grounds for garbage and targets for developers and squatters. These days, Indian authorities are trying to change that. As the key role that mangroves play in flood control, water quality, and wildlife habitat has become more widely appreciated, Mumbai has been the focus of new efforts to clean up mangrove areas, fence them off, and more aggressively monitor and protect them. The monitoring efforts will soon get a boost from satellites. In November 2017, the Maharashtra Forest Department signed an agreement with the Indian Space Research Organization (ISRO) to begin using satellite imagery to monitor mangroves in the state, including Mumbai. Images will be sent to the forest department on a monthly basis and will make it easier for managers to identify where mangrove loss and gain is occurring. The Landsat images above offer an example of how satellite imagery can be used to track changes to mangroves. These images are centered on Thane Creek — a key waterway that runs through the city. It is home to more than 59 square kilometers (23 square miles) of mangroves, according to one recent assessment from the Forest Survey of India. The first image was acquired in 1988; the second was captured in 2017. 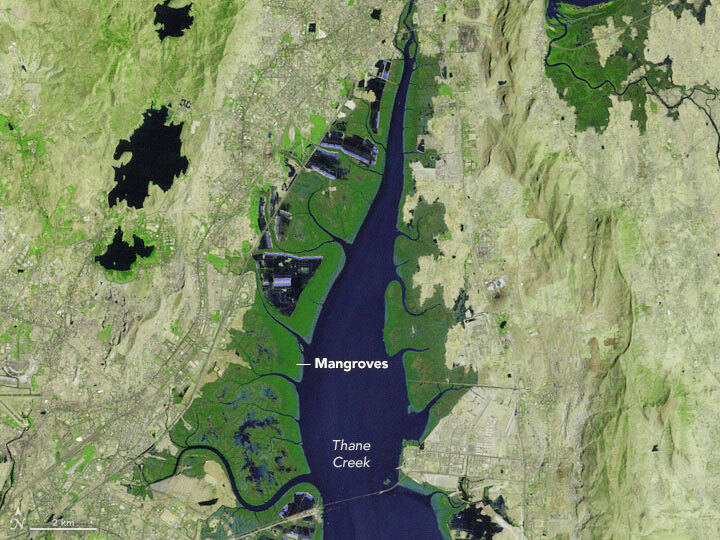 The dark green areas along Thane Creek are mangrove forests. The buildings and roads of urbanized areas appear gray and white. Both images were captured around high tide. 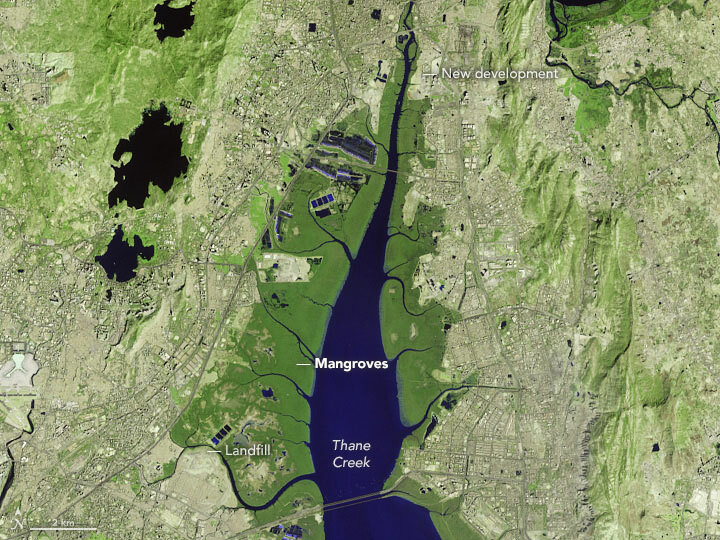 Turn on the image comparison tool to see where the city has expanded and where mangrove cover has changed. At the same time, the images illustrate another ongoing trend that bodes well for Mumbai’s mangroves. Over time, the deposition of sediment has narrowed the channel and allowed some mangroves to spread closer to the center of the creek. It is this type of expansion that has caused some researchers to report an increase in mangrove cover in Mumbai over the past 15 years, even as other scientists have reported significant long-term declines.